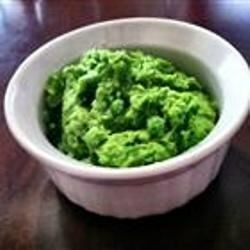 "Easy recipe for Mushy Peas (the kind served with fish & chips in pubs!) I like a little of the mint in mine ... some pubs use it, some don't. Enjoy!" Heat oil in a skillet over medium heat. Add green onion, mint, and peas. Cover, and cook for 3 to 4 minutes. Mash peas with a potato masher. Stir in butter, and season with salt and pepper. Nice recipe...great comfort food and really quick! I paired these with "Baked Lamb Chops" (by Leslie)...dinner in 30 minutes or less! Try adding a splash of white or malt vinegar - awesome. This dish was lacking in flavor, but I'm not sure what it was missing. It wasn't bad, but I'm not sure I would make it again.